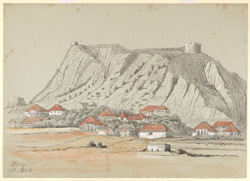 Pencil and water-colour drawing heightened with white of the cantonment bungalows and fort at Bhuj by Harriet Parr (fl. 1850-1852) in 1852. Inscribed on the front is: 'Bhooj. H.P. 1852'. Harriet married Thomas Chase Parr, a Bombay Army officer, at Bromley, Kent in May 1846. They arrived in India in November 1849. Parr was stationed at Bhuj on his return from furlough. Bhuj was the capital of the former princely state of Kutch and is now the head quarters of the Kutch district, Gujarat. The town was chosen by Rao Khengarji I as his capital in 1549. The fort was built on a hill to the east of the city and dates from 1718 to 1741. In March 1819 it was captured by a British detachment under Sir William Keir and was subsequently held by the British. The Cantonment and European residences lay at the foot of the hill. The town was damaged in an earthquake in 1819 which is reported to have destroyed 7,000 houses and killed over 1,000 people. In 2001 the area was again struck by a devastating earthquake.